Beyond the RIPE NCC membership, there is a diverse range of organisations with whom we work in various ways, including technical coordination organisations, industry groups, public regulators, law enforcement groups, academic institutions and more. Our essential goal in engaging with these organisations is to broaden support for and understanding of RIPE, the RIPE NCC and the global registry system. The RIPE NCC has entered into formal agreements (generally Memoranda of Understanding or Letters of Understanding) with several of these organisations. The purpose of these agreements is to foster greater understanding and more effective coordination and cooperation between both parties - and to ensure transparency to our membership and the RIPE community. In other cases, the RIPE NCC has joined membership organisations in which we can contribute to discussions on issues relevant to the RIPE community and the operations of the RIPE NCC. 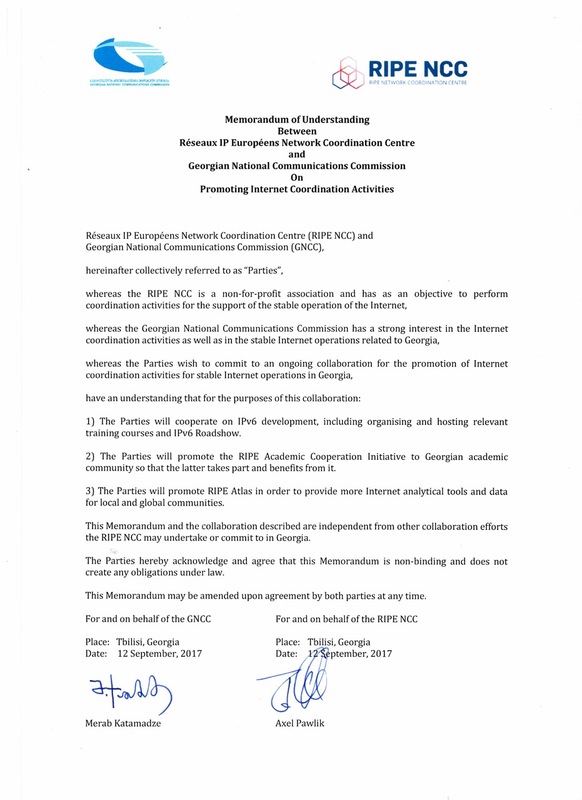 Signed by the RIPE NCC as part of the Number Resource Organization (NRO). Stipulates the role and responsibilities of the Address Supporting Organization (ASO) and the global policy development process as carried out by the NRO. Establishes the Number Resource Organization (NRO) and stipulates its role, structure and functions as the umbrella organisation for the existing RIRs. The Alliance for Internet of Things Innovation was created by the European Commission to bring together different IoT stakeholders in Europe and encourage IoT take-up in the region. The branch of the International Telecommunication Union (ITU) that develops and coordinates worldwide technical standards for information and communication technologies. The branch of the International Telecommunication Union (ITU) that promotes the development and improvement of information and communication technologies in the developing world.